The TGE-0010 monitors carbon dioxide levels between 0 and 2000ppm using a 'self-calibrating' infrared sensor to determine CO2concentrations. 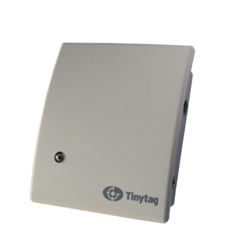 The discreet mains powered unit can help monitor air quality in a wide range of buildings. It can help to verify that indoor ventilation systems are performing correctly, thus preventing CO2 levels exceeding recommended limits. The TGE-0011 monitors carbon dioxide levels for specialised applications requiring monitoring between 0 and 5000ppm. It uses a 'self-calibrating' infrared sensor to determine CO2 concentrations. The discreet mains powered unit can help maintain indoor air quality, helping to verify that indoor ventilation systems are performing correctly and preventing CO2 levels exceeding recommended limits.